Since 1875, Audemars Piguet has been creating some of the most beautiful and spectacular watches in the world. With continuous innovation in technology, the Audemars Piguet Royal Oak Offshore quickly became the watch of choice for celebrities and artists, and remains one of the most sought after watches on the planet. Today, Audemars Piguet is where art joins horology. In this article, I am going to introduce you the AP Royal Oak Offshore Navy Chronograph watch,official model:26470ST.00.A027CA.01. This AP Royal Oak Offshore Marina Chronograph watch has unique functions including hours, minutes, seconds, chronograph and date. These functions are intelligently set on a blue dial with silver chronograph counters, white Arabic numeral markers, luminescent white-gold Royal Oak hour, minute and seconds hands and a date display at 3 o’clock with an AP logo right next to it.The watch’s comfortable and durable strap is made of blue rubber while the case is made of alluring polished stainless steel. In addition,the movement ot this watch includes a ‘Monobloc’ oscillating weight in 22-carat gold and contains 59 jewels and provids approximately 50 hours of power reserve. 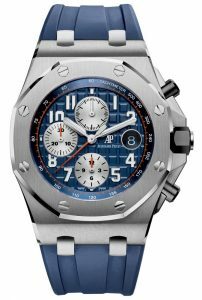 This AP Royal Oak Offshore Marina Chronograph watch is a real pleasure for Audemars Piguet enthusiasts, an excellent addition to the brand’s popular collection and perfect for those who want to stay ahead of the trend.As a reliable replica watch online site, we always provide high quality products, so does this replica watch.It is 1:1 well cloned and driven by high quality movement.It is important to note that all of our replica watches are not waterproof, so remember to take it off before you take a shower or swimming.Our aim is to let our customers have a pleasant shopping experience,if you have any questions about this replica AP Royal Oak Offshore Navy Chronograph watch,please contact us. Audemars Piguet watches is a Swiss watch brand,Royal Oak Offshore and Royal Oak are two of its famous series.Because the brilliant of these two series, so many people tend to ignore the Audemars Piguet’s other watches.Here in this post,I would like to introduce a special Audemars Piguet watch. 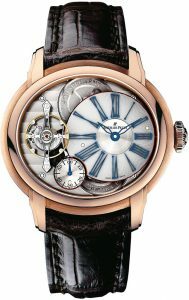 This is Audemars Piguet Millenary Minute Repeater Pink Gold 26371OR.OO.D803CR.01,the outstanding complications of this watch includes a unique skeletized dial and an off-center scintillating subdial. The beautiful white enamel dial has Roman numerals with blued hands and the finely tuned blued steel gong is fully visible around the circumference of the watch face.Most of the rest of the main dial is skeletonized except for the small seconds display of the clock shown at 7 o’clock. A perfectly balanced dial with very intricate and well-finished touches. Inside, this fascinating complication and elegant watch is driven by the fully conceived caliber, developed and produced Audemars Piguet hand-wound calibre 2928 composed of 443 parts, 40 jewels, flat double balance-spring and that offers almost seven days power reserve.To complement this stylish watch, the watch is equipped with a gorgeous hand-stitched brown crocodile leather strap that is secured by an 18-carat pink gold AP folding clasp. The belt wears very comfortably and the closure is very easy to operate. This watch is absolutely able to stand out among the many watches,there are also a lot of fans competing to buy it. But not all people have enough money to buy the original, so many people are more willing to choose our shop’s replica watch. As a reliable copy watch online site,we always provide high quality copy watches.This Audemars Piguet Millenary Minute Repeater Pink Gold 26371OR.OO.D803CR.01 replica watch on watchesyo.co has a solid 316 stainless steel case in high quality and is powered by high quality movement to assure precise time. If you want know more information about this replica watch,feel free contact us. In 1993, Audemars Piguet presented the world’s first oversized watch, the Royal Oak Offshore. The collection uses materials such as ceramics, rubber and carbon to create authentic watches designed to be sturdy and beautiful. 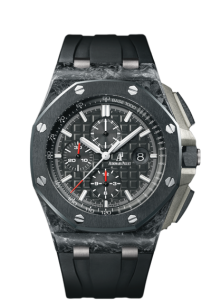 Here, in this post, I want to present the Audemars Piguet Royal Oak Offshore watch (official model 26400AU.OO.A002CA.01). Due to the inspiration of its iconic this timepiece is the much sportier sibling. To be honest, most of the time they are all attractive in their own way, and 26400AU.OO.A002CA.01 is no exception. The design of the Audemars Piguet Royal Oak Offshore 26400AU.OO.A002CA.01 is virtually unchanged since the beginning of 1971 models and is a tribute to the brilliance of the Genta.This watch is sporty and yet able to go from casual.The chronograph’s 44 mm case is in forged carbon, with a black ceramic bezel. But the identity of this luxury watch, from its relatively slender profile to the ‘mega tapisserie’ pattern on the dial. Both the crystal and caseback are in glareproof sapphire, allowing a perfect view on the dial, subdials and movement. The black dial beautifully contrast with smooth black counters.The hour markers are in white gold and applied with a good quantity of lume, as are the Royal Oak hands.The inner bezel is black and has a tachymeter scale printed in white. Inside,this timepiece features the exclusive AP Caliber 3126/3840 mechanical automatic movement with an instantaneous jumping date (midnight). Stop-seconds get precise time setting. The locking crown of the screw and the chrono pushers are made of black ceramic, with pushers protected by titanium protection. The sweeping lines of these guards emphasize the classic form of the Royal Oak case,adding muscle to the polished carbon of the case.Water resistant to 100 m.
The Audemars Piguet Royal Oak Offshore Carbon 26400AU.OO.A002CA.01 is a solid tool watch with surprising depths of beauty in its details.If you do not have enough money to buy this original watch, then you can buy a replica one on watchesyo.co. As a AAA replica watch store,The Audemars Piguet Royal Oak Offshore replica watch 26400AU.OO.A002CA.01 has the best quality in low price.It has a solid 316 stainless steel case in high quality,the Water Resistant is like all AAA replica watches only for live waterproof.This replica watch was powered by Japanese automatic or Quartz Movement to assure precise time,we also Offer Swiss ETA movement model and the box was offer too,if you need, contact us. Wish you have a pleasant shopping experience here!